Yoghurt soup (Yayla Corbasi Tarifi) might sound horrid, but it is a classic Turkish soup that I absolutely love. 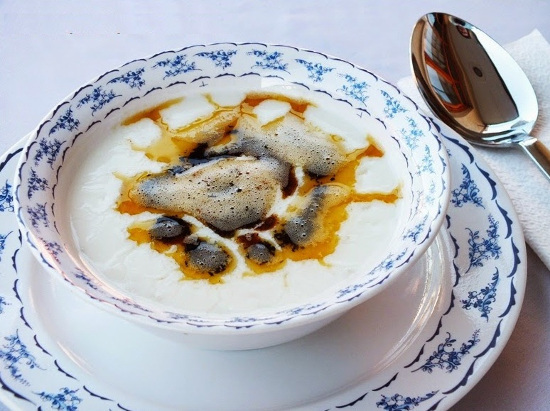 Anneanne (Koo’s mum) tends to make it out of a packet these days, but her home-made yoghurt soup is to die for. The thing about yoghurt soup is that it’s a brilliantly uplifting summer comfort food, almost a contradiction in terms, the equivalent of having a bowl of Campbell’s cream of tomato soup with a toasted bacon and cheese sandwich on a cold winters day – it hits the spot. And like chicken soup, ‘Jewish Penicillin,’ it’s a real healer that is deep in the pages of folk medicine. Put the washed rice and salt into a medium-large pan with the chicken stock; bring to the boil and simmer for 20 minutes – the rice must be cooked until very soft. Adjust the seasoning with salt and pepper. Remove from the heat and set aside until after next step. In a bowl beat the egg yoke with a very little cold water; add in the flour and mix until smooth. Then, slowly mix in the yoghurt, add a little more water if required to lighten the mixture – using a balloon whisk makes this whole process very easy! Now you’ve got to combine the rice and stock with the yoghurt mixture. Ladle about 2 tablespoons of the hot rice/stock into the yoghurt mixture and stir well, repeat this, and the mixture should be now very creamy. Now the difficult bit – too much heat will make the soup separate. Slowly pour the yoghurt mixture into the rice/stock while continually stirring. Don’t be too violent with the heat, bring the soup just to the boil, Keep stirring – don’t stop. As the soup heats up it will thicken, then as Soon as it comes to the boil, ‘remove from the heat.’ Turn the heat down to Very Low and simmer for 10-15 minutes – Stir occasionally. Meanwhile, melt a large knob of butter with the olive oil and add the paprika and dry mint; stir; don’t burn. Add the fresh mint, stir for about 25 seconds. Pour into the soup, mix and serve with fresh crusty white bread.